My little guy starts school this year. It’s a big step for all of us. I am excited, anxious, sad and filled with emotion all at the same time. Things are going to change. Our little routines will be no more as they give way to new ones and we will all have to adjust. I am treasuring every single minute up until that day when he will begin his new adventure (I will also treasure every single minute afterwards but you know what I mean). Starting school means lunch boxes 5 days per week and no doubt a ravenous little boy at 3pm as well so I am trying out some new recipes that will fill the hole in my growing boy’s tummy. 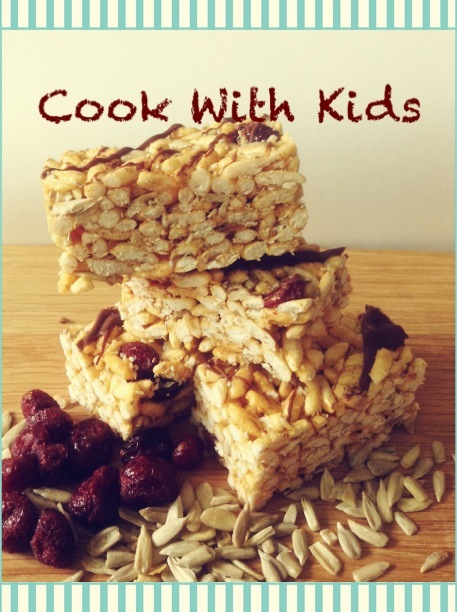 This is also a great recipe to make with the kids. Get them mixing and pressing. It’s great for that large muscle development! Place butter, coconut oil, sugar, honey and vanilla paste in a saucepan on medium heat until. Stir until melted. Combine other ingredients in a bowl and then pour over butter and sugar mix. Stir through until well combined. Press into a baking tin lined with baking paper. Drizzle over some melted chocolate if you wish. Refrigerate until set. Cut up into desired sized pieces.